The First, Second Year APBIE General, as well as Vocational Scholars, have recently been given a fresh timetable and date-sheet for the Andhra Pradesh Intermediate Public Examinations (IPE), to be carried out in Feb/March 2019. Now, the board has AP Inter Hall Tickets 2019 in its next to-do-list to upload at the official website “JnanaBhumi.ap.gov.in” for all Regular, Private, Supplementary, Betterment or Failed candidates. Board of Intermediate Education, A.P, Vijayawada is one of the authorized units of Government of Examinations in the state of Andhra Pradesh that commands the Junior & Senior Inter-Level Tests. At the recognized and prescribed centres, all the students will have to appear in their Higher Secondary Exams by bringing AP Intermediate Hall Ticket as a token of their Identity proof. The list of all exam places together with the examinee’s First & Second Year Hall Ticket numbers will be forwarded to the respective schools too. Moreover, one can search his/her e-admit card using an ID No, Name, School Name or with other general references. 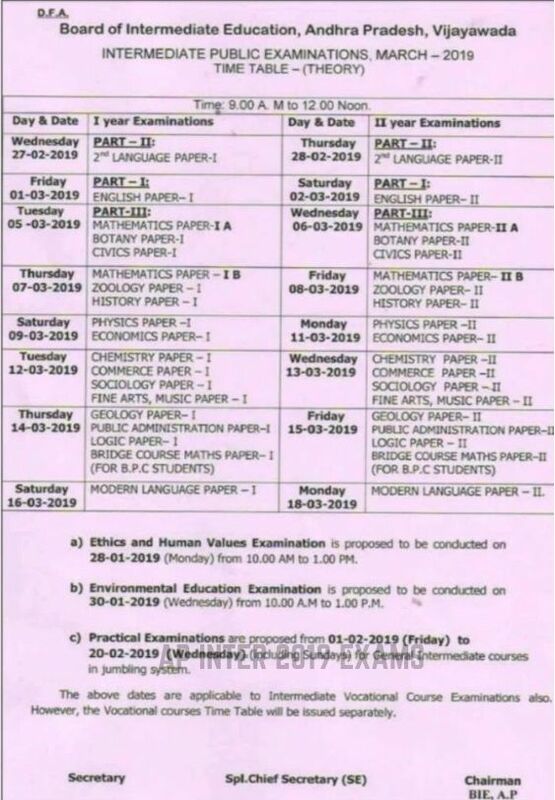 Movingly, we should be able to find out the subject- wise paper’s dates, days, and shift timings of Class XII Exams. Any issues concerning the same, you may post your queries and comments at the end of this article. Nearly a million students are all the way up to take part in the AP board’s final examination as they are moving towards the end of this current session 2018-19. All are advisingly said to boost up their preparations since the subject-wise schedule has been made available. * It must be noted that the exam for Ethics & Human Values will be taken on 27.01.2019 (Saturday) from 10.00 AM to 01.00 PM. * Environmental Education Test has been marked to conduct on 29.01.2019 (Monday) and that too at 10.00 to 01.00 PM Shift. * Other than this, a series of practical exams shall be taken place from 01 Feb to 21 Feb (including all Sundays) but except Mahashivratri (13.02.2019), for General Intermediate Courses. 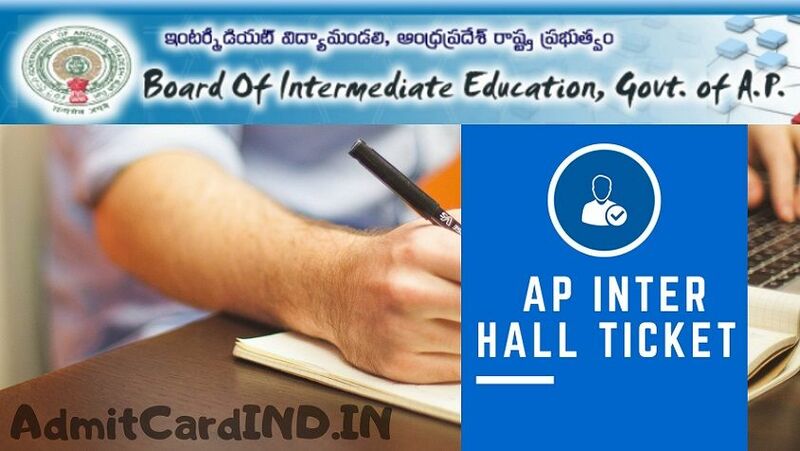 For AP Inter theory and practical exams, the BIE-AP Hall Tickets are going to be available at the above-said authoritative portals within 15 to 20 days in advance to the commencement of the events. It does not make a difference whether you are a Science, Arts or Commerce Student, all you would require is to fill your Name/User ID, Password in the given mandatory fields for the procurement of your Roll numbers. Moreover, The procedure to download the Andhra Pradesh Intermediate Hall-Tickets will remain the same for the Vocational students too. It’s just that while logging in, they may need to select the category of appropriate course. Candidates who appeared in the recently conducted Andhra Pradesh Intermediate Public Exams for Ist/IInd Year can check the results by 12.04.2019. The Board will announce results on the website – jnanabhumi.ap.gov.in & bieap.gov.in. In order to know results, candidates may require the hall ticket number of IPE Exam. Below is the link provided for downloading the exam hall tickets. Visit the new BIEAP Official Website – JnanaBhumi.ap.gov.in. Click on 1st 2nd Year Hall Ticket Link. Enter Enrollment/Registration Related details such as AP Inter Exam User ID, Date of Birth etc. Click proceed and wait for the Inter (12th) hall ticket online release. Print hall ticket details and carry this document in your IPE exams. Mentioned Below is an available online link to Hall Ticket/Admit Card that is directly connected to the official website. With the help of this, You may easily track the recent and more upcoming updates regarding the A.P. Inter Public Exams. I’m from Saraswathi Sri Chaitanya campus in Vijayawada. Intermediate ipe center for this hall ticket number (1805216430)? When the hall ticket will be released????????? Release reports of the test center, test ticket no. I had searched many websites but couldn’t get the hall ticket link and the exams are within a week. Sir kindly gives us the hall ticket link. Oh! We are really sorry for that inconvenience but actually, the hall tickets have not been published online yet and that’s the reason you could not download it yet. But we assure you once the BIEAP Officials uploads the same on their website, We will put the direct links for 1st, 2nd-year hall-tickets here at “AdmitCardIND.IN”. So, Stay tuned.